PSB M4U 4 review | What Hi-Fi? The PSB M4U 4s have very big shoes to fill. 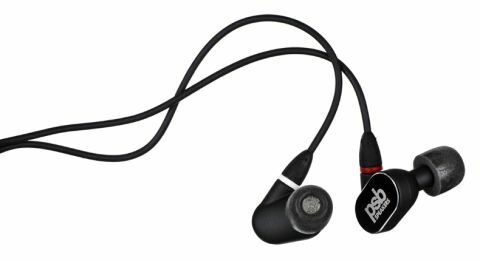 Not only are we fans of PSBs’ over-ear cans (M4U 1 and M4U 2), but they’re also the company’s first stab at a pair of in-ear headphones. These in-ears come with a hefty price tag, which puts them up against some mighty talented competition. Our favourites are the the Award-winning Shure SE425s, which cost £200 and are magnificent. So how do the PSBs fare next to such formidable competition? We start with grunge ballad Creep by Stone Temple Pilots, and are met with a full-bodied sound that gives a good impression of what the PSBs are capable of. They go loud. They’re big and open. They have a lot of oomph in the bass department. There’s plenty of detail to pick out the strums of bass strings and the lilting quality of voices. The late Scott Weiland’s raw and powerful vocals shine through with a strong sense of solidity running throughout the midrange. While a day’s running-in will get rid of any top-end brightness, there’s a slight touch of hardness in the treble. It’s not enough to mar the experience, but some may find it weary to listen to. We could do with more clarity and subtlety, though. Where the Shure SE425s amaze us with their breathtaking insight and transparency, the PSBs offer a more laidback performance. The guitars and drums charge ahead at a decent tempo, but they sound just a little sludgy – even for a 90s grunge band. It makes the M4U 4s comfortable to listen to, although you’ll want a bit more excitement and attack with familiar songs. That’s partly because of that warm and fuzzy bass performance. The PSBs plunge deep (admirably so for a pair of in-ears), but they’re not as well defined and taut as the Shure SE425s. That deliciously squelchy bassline from Sbtrkt’s Wildfire thuds softly – we want a punchier, tauter impact. Tighten up that bass, and the PSBs could be so much more attacking and rhythmically exciting. PSB has gone for a round-the-ears design for the M4U 4s, which loop around the ears for a more secure fit. We wish they had the flexible wire inserts you can mould to your ear-shape like the Shure SE425s have, but even after a few wiggles and tugs, the PSBs do stay put. The chunky earbuds are lighter than they look, though, which means you won’t get worn down when wearing them for hours. You get a good selection of ear tips in the box – three pairs each in foam and silicone – and it’s worth trying them all out to find the best seal. You’ll know it’s the right fit when you get maximum bass, sound doesn’t leak out (or leak in), and the buds don’t pop out of your ears when you move. The overall design is fairly muted, with a flash of metal around the edges breaking up the plain design. The M4U 4s come in two colours: black diamond and arctic white. Our one slight complaint is that the in-ears aren’t clearly marked as left or right. You’ll have to go by the colour trim where the cables join the earbuds: red for right, white for left. We do, however, like that PSB has packaged two cables in with the M4U 4s: one with in-line mic and a three-button remote, and one without. The controls are responsive and easy to operate, and both cables are thick and sturdy enough that they don’t get tangled up. Splashing out over £200 for a pair of in-ears is an extravagant act, but if you’re going to treat yourself, the PSB M4U 4s are worth a listen. However, the standards are high in the ever-expanding in-ears market, and these PSBs need to be just a little bit more discerning – and more accurate – to beat the best.